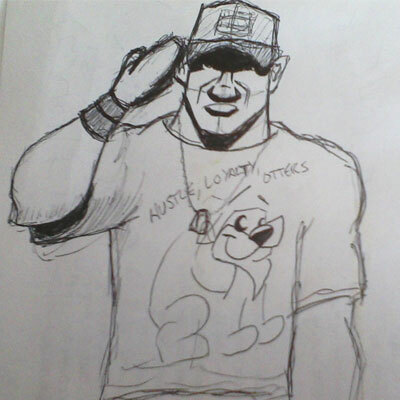 You’re probably wondering, “Why did you doodle an otter t-shirt on your John Cena drawing, Gordon?” Good question. What really happened was I had doodled a picture of an otter. THEN I doodled a picture of John Cena’s head. THEN the meeting I was in went long and John Cena ended up getting an upper torso. It just so happened that the two works of art overlapped. However, the catchphrase, “Hustle, Loyalty, Otters?” That’s only because the slogan “You Can’t See Me and My Two Layers of Fur That Keep Me Warm When I Swim in the Winter” didn’t fit. This entry was posted on February 28, 2012 at 4:38 pm and is filed under Wrestling Whatnot. You can follow any responses to this entry through the RSS 2.0 feed. You can leave a response, or trackback from your own site.